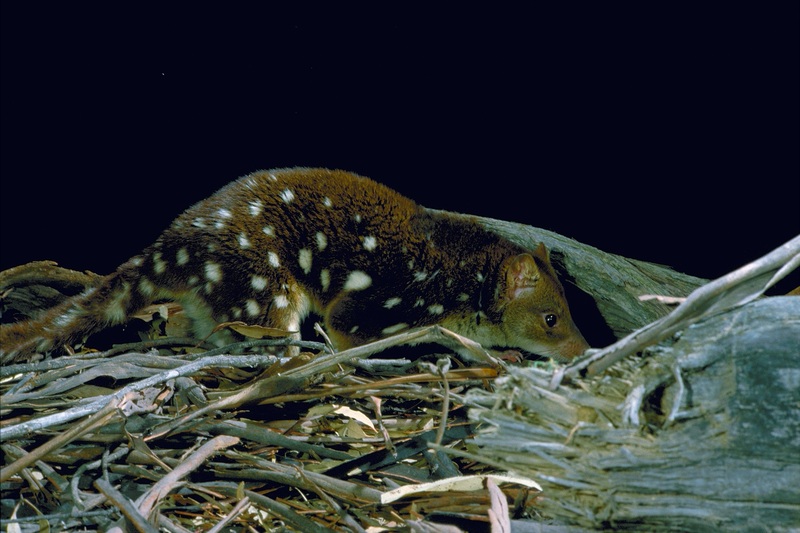 We're revising the plan to better protect the Spotted-tailed Quoll . The ACT Government sought your insights and thoughts on a Draft Spotted-tailed Quoll Action Plan. Thank you to everyone who participated in the engagement. Your ideas are being considered in the finalisation of the action plan, expected in 2019. The consultation report will be available shortly. Please note that submissions will not be made public and detailed responses to individual submissions will not be provided. 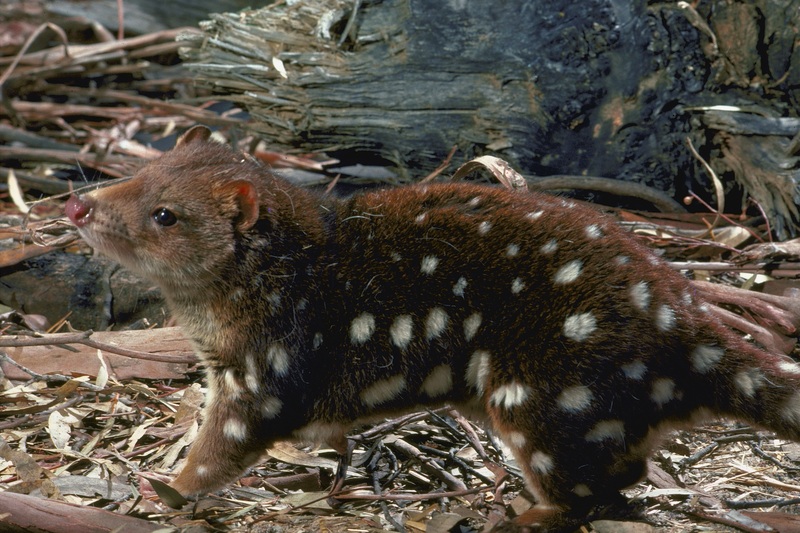 The Spotted-tailed Quoll has almost disappeared from the ACT. The ACT Government is revising its plan to better protect the quoll and its habitat and seeks your input. Also known as the Tiger Quoll and Tiger Cat, the Spotted-tailed Quoll preys on animals such as possums, rabbits, birds, reptiles and invertebrates—and is also known to scavenge food. The carnivorous mammals use multiple dens and regularly move between them. Den sites can include rock crevices, hollow logs, tree hollows, clumps of vegetation, underground burrows and under buildings. 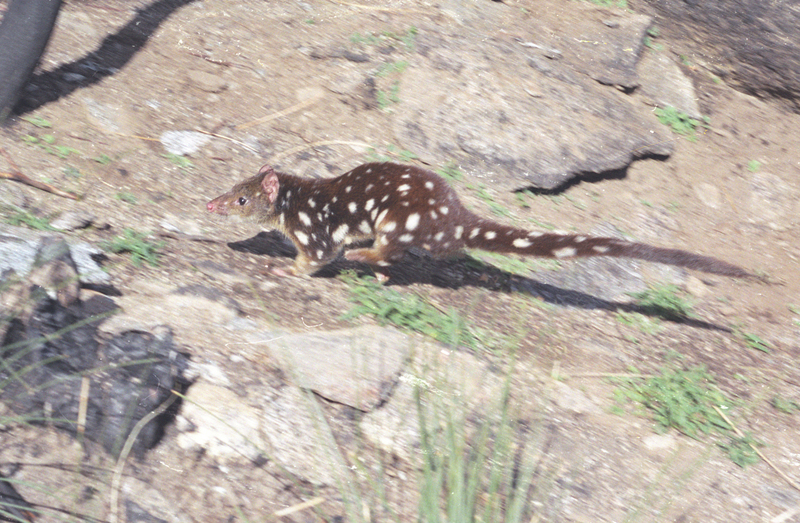 Although found from southern Queensland through to south-western Victoria and Tasmania, the Spotted-tailed Quoll is listed as vulnerable in the ACT, endangered under the Commonwealth’s Environment Protection and Biodiversity Conservation Act 1999 and as threatened in all other states where it occurs. Its distribution and abundance has declined since European settlement, with only occasional sightings across the ACT since the 1950s. Major threats to the species are changes to habitat, timber harvesting, poison baiting, competition and predation from introduced carnivores such as foxes and cats, road mortality, bushfire and climate change. The action plan seeks to maintain in the long-term, suitable habitat conditions that will support wild populations of Spotted-tailed Quolls in the ACT by preserving key habitat features, managing any threats to them, knowing more about them and contributing to their regional and national conservation. Better protect the Spotted-tailed Quoll in the ACT and inform the development of the final action plan. The Spotted-tailed Quoll is a different species from the Eastern Quoll currently being reintroduced to Mulligans Flat Woodland Sanctuary. Spotted-tailed Quolls are larger and have spots on their tail as well as their body. Why should the quoll be protected? Why is a new action plan being prepared for the Spotted-tailed Quoll? Action plans are prepared by the Conservator of Flora and Fauna to help protect threatened species and ecological communities in the ACT. An action plan outlines conservation and protection proposals for the species or community concerned or proposals to minimise the effect of threatening processes. The primary objective is to maintain for the long term, viable, wild populations of each species (or samples of the ecological community) as components of the indigenous biological resources of the ACT. The Spotted-tailed Quoll is the largest marsupial carnivore on mainland Australia and plays an important ecological role as a high order predator. Since European settlement, the distribution and abundance of Spotted-tailed Quolls has declined. Populations have become fragmented and isolated and estimates of the decline range from 50–90% for mainland Australia. Causes of this decline include modification, fragmentation and loss of habitat, poison baiting, deliberate killing, competition and predation from introduced carnivores, road mortality, bushfire and prescribed burning. The Spotted-tailed Quoll is listed as nationally Endangered, Vulnerable in the ACT, and threatened in all other states it occurs. Action plans are reviewed every 10 years. This new draft incorporates information underpinning the National Recovery Plan for this species that was published in 2016, other recent research findings and updated information recent records of the species in the ACT. How many quolls are left in the ACT? Spotted-tailed Quolls are very rare in the ACT and are elusive in nature, so are hard to detect. Since the 1950s there have been 29 confirmed sighting records (live or dead) and a further 32 records (hair, scats or DNA) of Spotted-tailed Quolls in the ACT. More recently there has been an average of one incidental animal sighting per year since 2005. This low detection rate is despite several surveys in recent years. Wildlife cameras are currently in place in potential quoll habitat in Namadgi National Park in an attempt to detect the species. What actions does the draft action plan propose to protect the quoll? 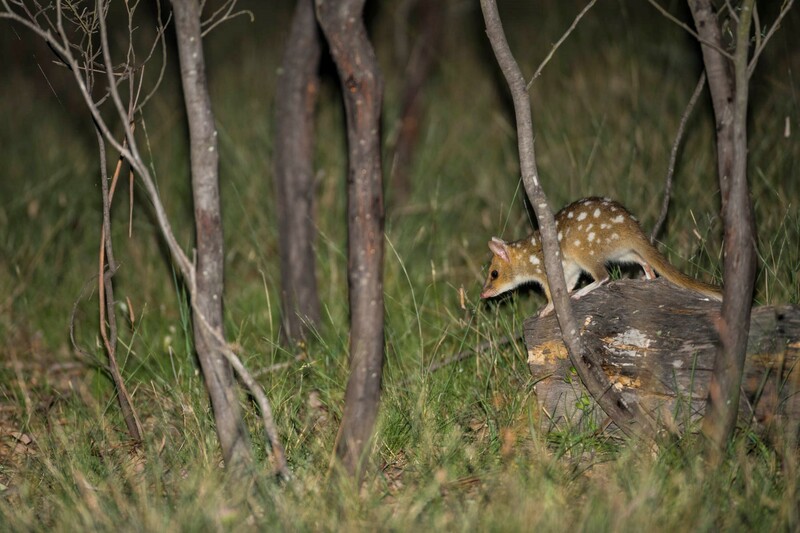 Due to the limited sightings in the ACT, it is unclear if a population of Spotted-tailed Quolls still occurs in the ACT, or if the occasional sightings are of individuals moving through the ACT from nearby NSW. As such, the goal of the draft action plan is to maintain in the long-term, suitable habitat conditions that will support an endemic population of Spotted-tailed Quolls in the ACT. Specific management actions for Spotted-tailed Quolls in the ACT are focused on maintaining key habitat features and habitat complexity for the species to persist and minimising adverse impacts on quolls when undertaking land management activities. 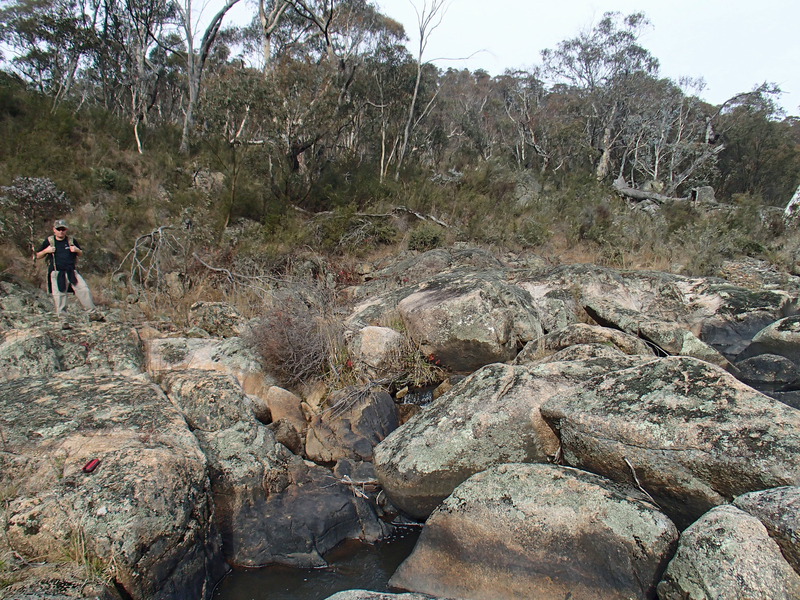 Much of the quolls potential habitat in the ACT is protected in Namadgi National Park, Tidbinbilla Nature Reserve and the Murrumbidgee River Corridor. Within these areas, any prescribed burning activities will be implemented in a way that will protect critical habitat features, such as rocky outcrops and hollow bearing trees, and pest predator baiting programs will follow best practice guidelines to minimise the risks to quolls. 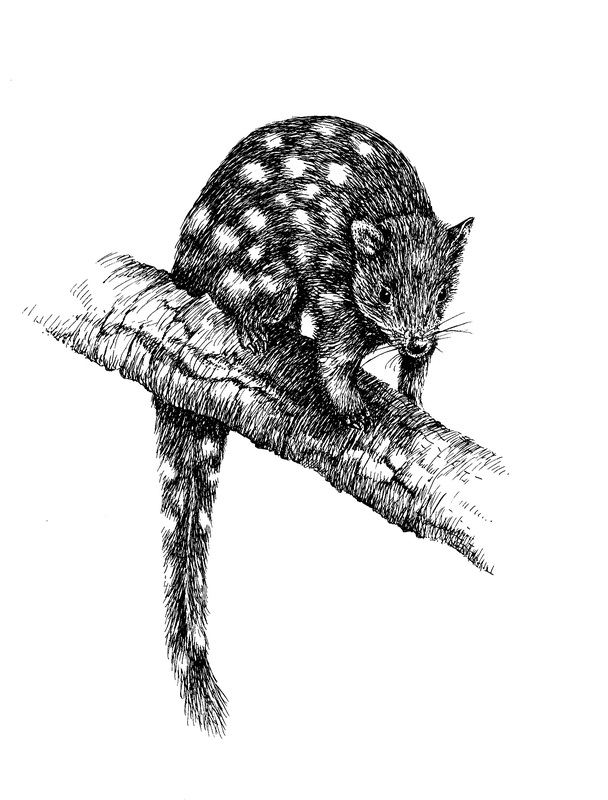 Other actions to help conserve the Spotted-tailed Quoll include undertaking surveys for the species; supporting research to better understand quoll ecology, habitat and threats; strengthening coordination with regional and national networks and promoting the conservation of the species within the community. What’s the difference between this quoll and the ones at Mulligans Flat? The species of quoll that has been reintroduced to Mulligans Flat Woodland Sanctuary is the Eastern Quoll. Following their extinction on the mainland in the 1960’s, Eastern Quolls are now only found in the wild in Tasmania. As well as Mulligans Flat, the species was earlier reintroduced to Mt Rothwell Biodiversity Interpretation Centre in Victoria and a reintroduction is underway at Booderee National Park in Jervis Bay, NSW. Spotted-tailed Quolls are larger than Eastern Quolls. Male Spotted-tailed Quolls have an average weight of 3 kg (although they can weigh up to 7 kg!) and females have an average weight of 2 kg. Their fur ranges from rich rufous brown to dark above while pale below and they have white spots of varying size over the body and tail. On average, male Eastern Quolls weigh 1.3 kg and females weigh 0.9 kg. Eastern Quolls vary in colour from fawn to black, and have small white spots of varying sizes covering their body, except on the tail. The tail is bushy and may have a white tip. What should I do if I see a Spotted-tailed Quoll in the ACT? Spotted-tailed Quoll sightings (live or dead) can be reported to Access Canberra on 13 22 81 or https://www.accesscanberra.act.gov.au/app/ask/. The date of the sighting, detailed location information and, if you can get one, a photo will help us verify your sighting. If you have a photo, quolls sightings can also be reported on Canberra Nature Map https://canberra.naturemapr.org/.